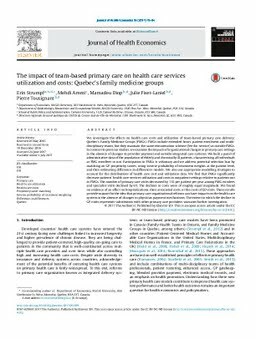 We investigate the effects on health care costs and utilization of team-based primary care delivery: Quebec's Family Medicine Groups (FMGs). FMGs include extended hours, patient enrolment and multidisciplinary teams, but they maintain the same remuneration scheme (fee-for-service) as outside FMGs. In contrast to previous studies, we examine the impacts of organizational changes in primary care settings in the absence of changes to provider payment and outside integrated care systems. We built a panel of administrative data of the population of elderly and chronically ill patients, characterizing all individuals as FMG enrollees or not. Participation in FMGs is voluntary and we address potential selection bias by matching on GP propensity scores, using inverse probability of treatment weights at the patient level, and then estimating difference-in-differences models. We also use appropriate modelling strategies to account for the distributions of health care cost and utilization data. We find that FMGs significantly decrease patients' health care services utilization and costs in outpatient settings relative to patients not in FMGs. The number of primary care visits decreased by 11% per patient per year among FMG enrolees and specialist visits declined by 6%. The declines in costs were of roughly equal magnitude. We found no evidence of an effect on hospitalizations, their associated costs, or the costs of ED visits. These results provide support for the idea that primary care organizational reforms can have impacts on the health care system in the absence of changes to physician payment mechanisms. The extent to which the decline in GP visits represents substitution with other primary care providers warrants further investigation.